New bird owners often have questions about the proper ways to bathe their birds. The truth is, there are a few right answers. While at times it can take some effort on the part of the owner to single out the grooming methods that will work for a particular bird, bathing is important to a bird's health and even reluctant birds must be conditioned to accept it. Use only plain, clear water. Although some pet supply companies market commercial "bird shampoos", the best and safest way to bathe your bird is with plain water. Birds produce a special oil that they preen their feathers with, and this oil can be stripped through the use of soaps or detergents. This can result in unhealthy feathers and unhappy birds. Only bathe your bird during the warmest part of the day. Wet birds easily get chilled, which can be a serious health hazard. Bathe your bird during a warm part of the day so that your bird's feathers have a chance to dry completely before the temperature drops towards nightfall. Make sure the water is a comfortable temperature. Water that is too hot or cold can shock a bird's system, not to mention causing burns and a host of other serious conditions. Always check the temperature of the water before offering your bird a bath. Many birds prefer their bath water to be lukewarm or room temperature. Never saturate your bird's feathers. In the wild, birds never allow their feathers to become completely soaked through. This can lead to loss of body heat and flight impairment. Except in extreme circumstances, it should never be necessary to completely soak a pet bird. If you always follow these simple rules of bathing, you can ensure that bathtime for your pet will be a safe activity, no matter which bathing techniques you may choose. There are a few different bathing options that owners can try to figure out what their bird will enjoy. The most important variables in effective bathing are frequency and method. By "experimenting" with these aspects, you are sure to stumble across the right combination for your feathered friend. Birds vary greatly in the ways that they choose to bathe. Some birds love the feeling of a trickling shower, some prefer to stand in a fine mist, and some like to dunk themselves in a pool of water. Try the following techniques at home with your pet to see which works the best for him. Prepare a shower for two. 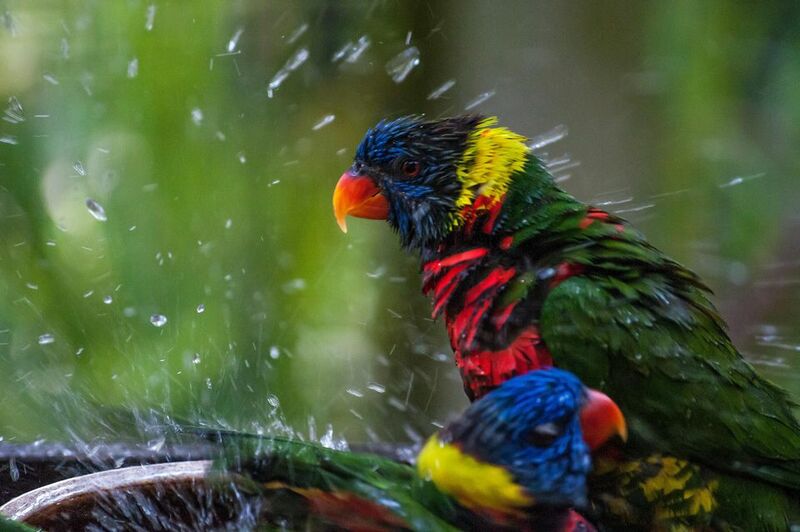 Being naturally social creatures, birds often enjoy a taking a shower with their owners. There are even various avian shower products available such as special shower perches and sprayers. If you choose to introduce your pet to the shower, it's best to do so with extreme patience at first. Allow your bird to watch you in the shower before attempting to convince him to join you. He should decide on his own that the shower is a friendly thing, and poses no threat to his safety. Placing your bird on the floor of the shower stall or tub while giving a shower is probably the safest method of keeping your bird safe from falling off of a perch. Sample a soothing mist. A fine mist from a clean spray bottle is the method of choice for some birds. Many pet bird species originate from extremely warm and humid climates, and the spray helps to rehydrate their nasal cavities as well as clean their feathers. If you think your bird might benefit from a quick spritz, be sure to use pure warm water in a clean new spray bottle. This ensures that there are no chemical residues that could be toxic to your pet. Go for a dip in the sink. Many birds like to dip themselves into a pool of still water. Try pooling a bit of warm water in your sink and having your bird step down into it. Chances are that your bird's natural bathing instincts will take over from there, and he will be happily splashing about in no time. If you own a small bird that is reluctant to stand in the sink, try cupping warm water in the palms of your hands as your pet perches on the side of your thumb. Many times a bird will feel safer bathing in his owner's hands -- and this can also be a great bonding experience. Wet lettuce leaves are a favorite of small birds to brush up against and to bathe on. Smaller birds sometimes enjoy rolling around on wet produce leaves. Simply wet the leaves of swiss chard, kale or other types of produce and place on the floor of the enclosure or on a shallow plate or bowl. They might enjoy contact with the leaves and get the water on their feathers which will get the loose dander and dust off of them. If you observe your bird's reactions to these different techniques, it should be relatively easy to identify the one that your bird enjoys most. This, however, is only half of the "bird bathing equation". Deciding how often your bird should be bathed is the next step in achieving grooming greatness. Do you notice your bird bathing in his drinking water? When a bird decides that it's time to bathe, he will bathe in any manner that is available to him. For captive birds, this is most often means a dip in a drinking dish. If you notice your bird doing this fairly often, you can take it as an indication that more frequent bathing would be appreciated. Do your bird's species require more humidity than others? Birds that originate from tropical areas and rainforests are acclimated to daily rain showers and extra humid conditions. More frequent baths for birds of this type would likely improve feather condition as well as overall health and happiness. Is your bird going through a molt? When birds molt, new feathers push their way through the skin, dislodging old feathers on the way. These new feathers are covered with a sheath of keratin that sometimes needs to be softened so that the feather inside can break free. Bathing your bird more frequently during a molt can help release these new feathers and soothe itchy skin. Baths also encourage preening, which will help your bird shed the old molted feathers. By building a grooming routine around your bird's natural preferences, you will make bath time a smoother and much more enjoyable experience for your pet. Pay attention to your bird's reaction to various bathing techniques, and stick with the ones that work best for both of you. Enjoy the time that you spend grooming your pet, and make it obvious to your bird that you view bathing as a positive experience. The end result will be a happy, healthy, squeaky clean, and beautiful companion -- and what bird owner could ask for anything more?